Richard Spilsbury’s new middle grade book, Hi-Tech Clothes: Design and Engineering for STEM , is going to light up students’ passions, whether they are interested in fashion, design, engineering, or sustainability issues. How does hi-tech relate to clothes? Spilsbury is looking at clothing that uses up-to-the-minute technology for a number of different purposes, from shirts with speakers built in, to high fashion with LED lights to add interest, to new materials that keep the wearer dry, warm or even allow them to swim faster. If there is a need, there’s probably a clothing engineer trying to meet it. Having previously reviewed a book about new frontiers in wearable technology, I had certain expectations what Hi-Tech Clothes would cover. Boy, was I surprised because it covers not only cool STEM, but also how the clothing industry impacts our world. Spilsbury suggests clothes have a life cycle, and spends a great deal of time investigating the consequences of our buying habits and what happens to old clothes once they have been discarded. Scientists and engineers are tackling some of these problems, with new sustainably-produced materials and biodegradable cloth. He also pulls no punches, showing the human costs involved in the manufacture of clothing. The serious side of the clothing industry still doesn’t undermine the cool aspects of new technology used in fashion. This video features some of the “flashy” dresses designed by the fashion company CuteCircuit. Edit: I have removed the video because it self-plays. You can see it here. Have you seen these? What do you think? It reminds me of the luminescent patterns of deep sea creatures. One of the websites recommended in the back matter, fairytalefashion.org, shows the intersection of STEM and fashion. This fashion show is the culmination of a number of different experiments with clothing engineering. What a great way to get students outside of their chosen field! After seeing clothes that move, light up and release balloons, what could be next? 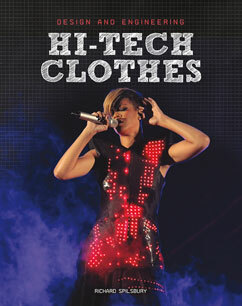 Hi-Tech Clothes is sure to be a jumping off point for more research on a wide variety of topics. What more can you ask for in a book? Disclosures: This book was provided by the publisher for review purposes. I am an affiliate with Amazon so I can provide you with cover images and links to more information about books and products. As you probably are aware, if you click through the highlighted title link and purchase a product, I will receive a very small commission, at not extra cost to you. Any proceeds help defray the costs of hosting and maintaining this website. Nonfiction Monday is a blogging celebration of nonfiction books for kids. We invite you to join us. Nonfiction Monday is a blogging celebration of nonfiction books for kids. We invite you to join us. For more information and a schedule, stop by Booktalking to see who is hosting each week. Today’s round up is at Wendie’s Wanderings.